We are very happy to welcome Phil Garrison of Wavespan to the roster of Earth Mantra artists, with his lovely and provocative new dark ambient tone poem entitled Infinite Space. And what a release it is. A long-form ambient piece performed entirely with gong, tibetan bowl, bells, and voice, Infinite Space was born of a class project to explore the theme of 'metal' (the form of matter, not the music genre), and is the logical successor to Wavespan's previous release Tilling the Soul on Dark Winter. Fitting the theme perfectly, the name Infinite Space comes from the concept of 'wuji', which in Daoist mysticism is associated with the element of metal. Phil used a remarkably sparse and direct method to produce this lush music. Because the piece was recorded in various chunks in real time, Phil used looping pedals and an analog filter to process sound on the fly. The sounds were all recorded on a simple four-track tape deck over a period of several days, amounting to nearly three hours of total material. Each take was a snapshot from a particular moment in time, each a session in which a different idea was explored. After recording, the tapes were imported into the computer and edited into the current form, with only the minimal amount of post-production required to bring the piece into a unified whole. And the result can only be described as mesmerizing. To be sure, this is dark ambient, with plenty of rumblings and obscure, impenetrable waves of sound, but there is something uplifting, organic, and just plain beautiful about this music as well, emanating from the lovely bells and chromatic percussion Phil played. This is the kind of ambient music that crosses boundaries, and will likely appeal almost as much to lovers of lighter ambient fare as it will to those who love the music dark. And clocking in at over forty minutes end to end, it is certainly a longplayer, but one that is masterfully paced, perfect both for active listening as well as making an inspiring backdrop for nearly any activity. Folks, we listen to a lot of ambient music, including much of the dark variety, and we can safely say that Phil Garrison of Wavespan is making some of the most exquisite, most intelligent, and most evocative dark ambient music we have heard in a long time. 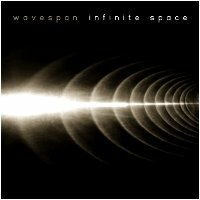 We're very proud to bring Infinite Space to our listeners, and hope that Phil brings us much more of his unique musical perspective in the future. Excellent dark and droney ambient with spooky sounds throughout the music, like a horror-film soundtrack,...definetely headphone music.